Bear Creek Adventures LC specializes in guided hunts for Rocky Mountain Bighorn sheep in the Wheeler, Latir and the Pecos Wilderness. 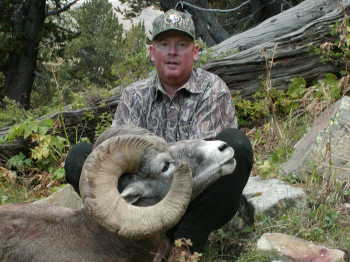 New Mexico selects sheep hunters through the lottery process, and they are once-in-a-lifetime hunts; therefore, it is of great importance to make your opportunity to hunt these awesome animals count by hiring an experienced and proven SHEEP outfitter. The Pecos is a true wilderness hunt with 223,667 acres of meadows, glades, forests and tundra and a sheep herd currently numbering about 350 animals and offers a challenging hunt. 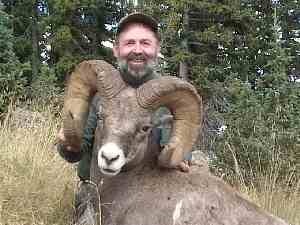 The Wheeler is more limited in size at 19,000 plus acres, however, it`s current sheep population is around 300 animals. Out of a total of 22 rams taken in the Wheeler to date, 4 have scored over 190 B&C points with the largest being the new state record at 198 7/8 B&C points. 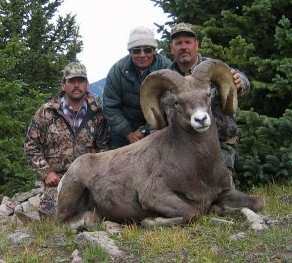 Although the Pecos herd is much older, B&C scores have continued their upward trend and produces B&C rams annually. Your chances of drawing a license to hunt sheep in the Pecos are much better as there are 10 public tags issued where there are only 4 in the Wheeler. The NMDG&F has authorized one of the 10 public tags as a youth hunt for hunters under the age of 18. The bag limit for the youth hunt is any ram. BCA`s 100% success rate over the past 13 years has produced many trophy rifle kills including several B&C and Pope & Young rams. 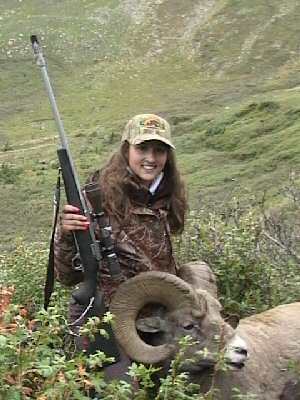 BCA`s guides scout nine to ten months of the year because of proximity to the areas and in the process of other hunts. 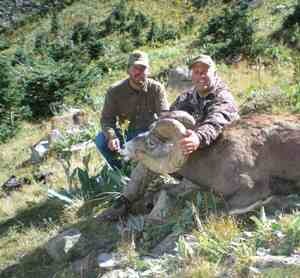 These are physically demanding hunts at altitudes from 11,000 to over 13,000. BCA uses horses extensively, but some of the hunt can only be done on foot. Hunters are expected to be in top physical condition. You will find our staff, equipment and livestock to be some of the best in New Mexico. Our camps consist of large wall tents heated with wood burning sheepherder stoves, cots with foam pads to sleep on, and a shower for extended trips. The comfort that these tents and equipment provide, allow the hunter to get the rest and relaxation needed to put your energies into hunting. Also, should we get snow or other inclement weather during the hunt, you can easily dry out clothing and prepare yourself for the next days` hunt. Our cooks constantly strive to provide clients with fare that is usually found only in fine restaurants. Meals can be modified to your tastes or diet. With our 26 head of horses and accompanying tack and equipment, we have plenty of resources to accommodate hunters and guests without any problem. Scoring of trophy by NMDG&F. Six day hunt, plus one day into camp and one day out. Deposit of 50% required to book this hunt. Non-hunting companion $250.00 per day plus tax. Prices based on a camp with two hunters. For an additional fee we can provide a camp exclusively for YOU complete with all the above and two guides to assist you during your hunt. Please contact us for details. 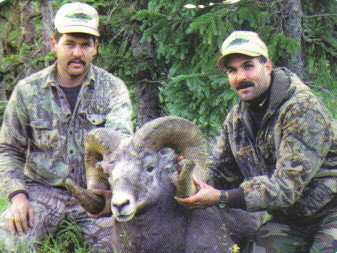 We wrote the book on sheep hunting in the Pecos Wilderness! Click here for a sneak peak. "Well organized and great all around operation. Beautiful scenery and a very enjoyable trip."